Kirkbymoorside (/ˌkɜːrbiˈmɔːrsaɪd/) is a small market town and civil parish in the Ryedale district of North Yorkshire, England, about 25 miles (40.2 km) north of York, midway between Pickering and Helmsley, on the edge of the North York Moors National Park. It has a population of about 3,000, measured in the 2011 Census as 3,040. Kirkbymoorside is noted as "Chirchebi" in Domesday Book (1086). It has served as a trading hub at least since 1254, when it became a market town. There are two ancient coaching inns extant, the Black Swan with its carved porch, and the cruck-framed George and Dragon, which originated in the 13th century. The Georgian façades point to later periods of commercial prosperity on the coaching route between York and Scarborough. Some Ancient British, Viking and Anglo-Saxon remains have been found in the vicinity. The Norman baron Robert de Stuteville built a wooden moated castle on Vivers Hill. The estate passed to the Wake family in the 13th century, who brought prosperity to the town. However, it was badly hit by the Black Death of the mid-14th century, after which the wooden castle lay in ruins. Prosperity returned after 1408, when the Neville family took over, although little remains of the fortified manor they built to the north of the town. The Nevilles remained Catholic and took part in the Rising of the North of 1569. By 1660 there was a grammar school. (The building is now part of the library.) The great Toll Booth in the middle of the town was built about 1730 with stone taken from the Nevilles' manor. The old Market Hall was gutted by fire but rebuilt in 1872. By 1881 the population of the town was 2,337. There is some dispute as to the correct spelling (the alternative spelling being Kirbymoorside (which is how the railway companies spelt the name on the station), as it is traditionally pronounced), but it is usually and officially spelled with the "k". Signposts also read "Kirkbymoorside". "Kirk" means church and "-by" is the Viking word for settlement, so the name translates as "settlement with a church by the moorside", or, as Ekwall argues, Moorside is "Moresheved" which means "top of the moor". A valley near the town is known as Kirkdale. More recently, Kirkbymoorside was the last town in England to adopt double yellow lines to restrict parking. George Villiers, 2nd Duke of Buckingham, died on 16 April 1687, in the house of a local tenant, from a chill caught whilst hunting nearby. England’s oldest fox hunt, still running today, is the Bilsdale Hunt in Yorkshire, which the Duke founded in 1668. The building, Buckingham House, is located in the town centre. Manor Vale, a stretch of woodland managed by the town council, was part of a deer park and contains the Grade II remains of the manor. It contains areas of both acidic and alkaline soil. It is home to a rare beetle species, Oedemera virescens. An electoral ward in the same name exists. The population of this ward at the 2011 Census was 3,444. The town is home to one of the few remaining British producers of light aircraft, Slingsby Aviation. (The other is Britten-Norman on the Isle of Wight). Many sub-sea vehicles and robots are also manufactured at Slingsby Aviation, which is located roughly 1 mile south of the town centre. The town is home to Kirkbymoorside Town Brass Band, which has achieved success on a national level, most recently winning the North of England Brass Band First Section Championship in 2004, 2008 and 2015. As a result of their 2008 success, the band competed in the National Finals in Harrogate on 28 September 2008 and claimed 3rd place overall. The anarchist poet and art critic Herbert Read was born in the hamlet of Muscoates, about four miles (6.4 km) south of Kirkbymoorside, and the area surrounding the town provided some of the inspiration for his only completed novel, The Green Child. kirbymoorside[sic] railway station was connected to the national railway network from 1875 until 1964 as part of the Gilling and Pickering line. The track was lifted by August 1965. The last passenger trains ran in the early 1950s, but a goods train ran from Malton via Gilling East until 1964. The rails between Kirkbymoorside and Pickering were lifted in the 1950s and the main A170 road runs over part of the track bed to the east of the town. There were plans, since withdrawn, for a Tesco store to be built on the site of the old railway station, which caused some controversy. The station buildings were demolished in 2010 and the site is now occupied, in part, by new houses. Today the 128 bus route is run by Scarborough and District (part of the East Yorkshire bus company)[clarification needed] from Helmsley to Scarborough and passes through the town via West End and Piercy End. The service operates at approximately hourly intervals on Mondays to Saturdays but actual times vary from hour to hour. In summer the service forms part of the Moorsbus network on Sundays and Public Holidays when it extends westwards beyond Helmsley to Sutton Bank. Connections to York are by the Stevensons of Easingwold company's 31X service via Helmsley. There is one direct bus to and from Kirkbymoorside on Monday to Saturday. Transdev operates the 840 route from Pickering to York and Leeds via Malton, accessible by using the 128 from Kirkbymoorside. There are no connections at Pickering between the two bus routes. The 840 also calls at Kirby Misperton, the location of Flamingoland theme park and zoo, and at Malton bus and railway stations. Kirkbymoorside has only a primary school. The town is in the catchment area of the comprehensive secondary Ryedale School, which is located in Nawton, three miles (4.8 km) away, and has about 600 pupils. Kirkbymoorside hosts an annual 10 km road running race on the Sunday prior to May Day Bank Holiday each year. The race was started in 2000 by Malcolm Hodgson, Dr Tim Hughes and Martin Lush to raise funds for local schools. It is now run by the Friends of Kirkbymoorside CP School and the funds go towards that charity and also the Gillamoor CE (VC) Primary School PTA. The Anglican place of worship is All Saints' Parish Church, a Grade I listed building dating back to the 13th century, but extensively restored in the mid-19th century under the direction of Sir George Gilbert Scott. There are 187 parishioners on the church's electoral role, of whom 27 are non-resident. There are two services each Sunday with a combined average attendance of 60–80. 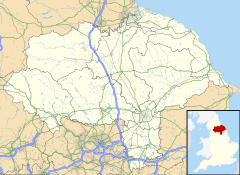 The Catholic church of St. Chad is served by two Benedictine priests from nearby Ampleforth Abbey; Kikbymoorside being in the Diocese of Middlesbrough. Although the church is not listed, it does fall within the Kirkbymoorside conservation area at Piercy End. The foundation stone was laid in 1896, and the church built on land acquired from Lord Feversham; the architect was Bernard Smith. There is also a Methodist church in the town. Earlier there were also Independent and Primitive Methodist chapels. The Bethel Chapel was an independent chapel built in 1792. During the period 1861–77 the minister was the former missionary John Abbs. The single-storey Quaker Meeting House in West End dates from 1691. Some 20–30 people worship there on Sunday morning. It belongs to the Pickering and Hull area meeting. Among those buried in the Quaker burial ground was the evangelist John Richardson (1667–1753), who left a lively account of his life as a preacher in Britain, Ireland and the American colonies. Kirkbymoorside is home to Kirkbymoorside Football Club which has been in existence since around 1890. After many years playing in the Scarborough & District League they moved to the Teesside Football League in 2005 and finished as runners up in Division One in the 2007–08 season and as a result moved up into the Wearside Football League which is a Step7 League and part of the National Pyramid system for the 2008–09 season, finishing in mid table, with a similar finish in 2009–10. 2010–11 saw a move up to 6th place and also an appearance in the final of the historic Monkwearmouth Charity Cup which sadly ended in defeat with Ryhope CW scoring the only goal in the last minute of extra time. The club also has a reserve side which play in the Beckett Football League, winning the League in 2010–11 by remaining unbeaten through the season and also winning the Scarborough FA Junior Cup, and several Junior teams. The football club shares facilities with the town's Cricket Club who, after finishing as runners-up in the 1st Division, now play in the Premier Division of the Reader's Scarborough Beckett League. The team is also a member of the Ryedale Beckett League, and play in the top division. The town has a golf club with an 18-hole, par-69 course. Three-time Ryder Cup captain Bernard Gallacher opened its new clubhouse in November 1998. The club celebrated its unofficial centenary in 2008. Being located on the southern edge of the North York Moors National Park, a wide range of other outdoor activities such as walking, cycling and climbing can also be done in and around the Kirkbymoorside area. ^ a b UK Census (2011). "Local Area Report – Kirkbymoorside Parish (1170217260)". Nomis. Office for National Statistics. Retrieved 14 March 2018. ^ Howat, Patrick (1988). The railways of Ryedale and the Vale of Mowbray. Nelson: Hendon. p. i. ISBN 0-86067-111-9. ^ Ekwall, Eilert (1960). The concise Oxford dictionary of English place-names (4 ed.). Oxford: Clarendon Press. p. 280. ISBN 0-19-869103-3. ^ Hunt site Retrieved 16 July 2017. ^ Town Council website: Retrieved 10 April 2011. ^ UK Census (2011). "Local Area Report – Kirkbymoorside 2011 Census Ward (1237325156)". Nomis. Office for National Statistics. Retrieved 14 March 2018. ^ "British Aviation - A Timeline". britishaviation-ptp.com. Retrieved 15 October 2017. ^ "Regional defence manufacturer invests in Scotland for growth". The Yorkshire Post. 9 November 2009. Retrieved 15 October 2017. ^ Wainwright, Martin (11 March 2013). "Farewell to the north". The Guardian. Retrieved 15 October 2017. ^ Barker 1998, p. 103. ^ a b "Disused Stations: Kirbymoorside Station". www.disused-stations.org.uk. Retrieved 9 October 2015. ^ "End of the line for Kirkbymoorside railway station". Gazette & Herald. Retrieved 9 October 2015. ^ Bus services in York Retrieved 9 March 2016. ^ "840 Leeds - York - Pickering - Whitby (includes X40) ~ Transdev". www.yorkbus.co.uk. Retrieved 13 October 2015. ^ "URN 121303 Kirkbymoorside Community Primary School". Department for Education. Retrieved 28 August 2015. ^ "The 50 listed historic buildings and objects in Kirkbymoorside:". Retrieved 10 April 2011. ^ "Church website" (PDF). Retrieved 10 April 2011. ^ "Surman Index". Retrieved 10 September 2016. ^ "Local Quaker site". Retrieved 10 April 2011. ^ "Area website". Retrieved 10 April 2011. ^ An Account of the Life of that ancient servant of Jesus Christ, John Richardson, giving a Relation of many of his Trials and Exercises in his Youth, and his Services in the Work of the Ministry, in England, Ireland, America, &c. (London: Luke Hinde, 1757). 4th e. (1791) online: Retrieved 29 September 2010..
^ "About". Kirkbymoorside Golf Course. Retrieved 4 January 2018.